I came across illustrator and animation concept artist Nate Wragg from his participation in the Terrible Yellow Eyes project, and was delighted with his work. Wragg is a member of Pixar Studios, and worked on the cartoon Pursuit. He also was an illustrator for the children’s book Too Many Cooks (Ratatouille), as well as being the author/illustrator of several other books, which you can find listed and linked on the right column of his blog. The blog has posts about his illustrations, commissioned art and work in progress. 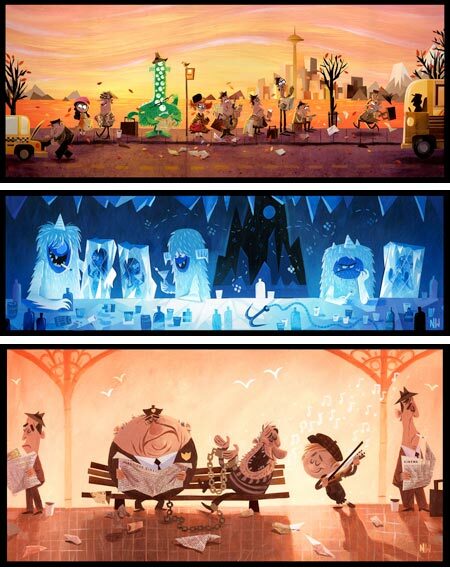 He also has prints and art for sale on his own site and on Gallery Nucleus. Wragg works, at least in some pieces, in acrylic, gouache and paper collage. His wonderfully snappy, angular style shows the pedigree of his work in animation; as does his knack for creating lively, offbeat characters. There is an interview on the Character Design blog. Wragg also uses a controlled palette to great advantage, with many pieces that are are almost monochromatic or duotone, in which a few carefully chosen color passages make the entire image pop. Nate is now working at DreamWorks animation.